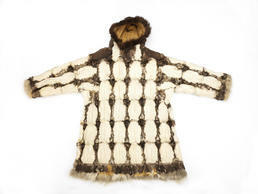 This parka is made from oldsquaw ducks, which were traditionally captured with nets or bolas. Like other birds, oldsquaws have the best skins in autumn after they have shed and re-grown their feathers. Aron Crowell: What time of year would people get these oldsquaw skins? Estelle Oozevaseuk: This is a fall skin I think. I think fall is the best time to get your skins, because in the summer time everything sheds. Aron Crowell: And what sort of fur is around the front of the hood there? Estelle Oozevaseuk: Dog. We often use black dog for a hood [ruff]. They double it up sometimes inside, but this one is just a single. Aron Crowell: In the catalog it says that this is an inner coat. Estelle Oozevaseuk: An inner coat is a very thin coat—murre skin, cormorant skin, this kind of skin. I think auklet is the one that is lightest. And also they use just the neck part for inner use, which is soft and light. These are the ones that you use in good weather, on top. Aron Crowell: So this would be the outside coat? Aron Crowell: Does this kind keep you dry? Estelle Oozevaseuk: I don’t think so. They’re not like living things when they’re dead, just the skin. You know live birds never get soaked, even when it’s raining. But when they die, they will really get wet. They may have some kind of protection under their feathers. Aron Crowell: They oil their feathers. Estelle Oozevaseuk: Yes, when they’re living, and when they die that thing dies too. Suzi Jones: Is this man’s parka? with a covering of skin with no hair—qaspeghaq [outer protective garment or any protective material for anything] we call it. Just like the covering for ours now from cloth—qiipaghaq [snow shirt, cloth cover parka] we call it. Branson Tungiyan: Kiigmi enkaam, kiigmi atuuwaat? Estelle Oozevaseuk: These thinner ones are good for summertime. But the heavier ones they use for winter. Mostly they wore in summertime [parkas made from] the neck skin of cormorants. Estelle Oozevaseuk: All kinds of birds’ neck-skin they saved. It took a lot of that [scraping]. Before they dry them out, they scrape the fat out. And what Grandma always used, like she [Marie] said, fresh urine to soak them in. And after they’re all soaked up, she scraped them. When she was done scraping them, after they dried, she soaked them again. And she strung them through the leg hole and tied them outside on the rack. The best thing to tan them is wintertime [winter weather], that’s what she said. Weather and wind would just bleach them up, and the odor is gone. [Hang the skins] outside for so many days, and of course they would freeze. If some wind was blowing, they started to get supple, just like a tanning them. And they have a special way for every bird skin [each kind] to cut them up. I forgot how to. Aron Crowell: Do you mean how you cut it so that you don’t get any holes in it? Estelle Oozevaseuk: Yes. Every time she cut it — the back skin — she saved them. It’s about this big [approximately 10x5 inch rectangle], and this makes a good parka like this kind. 1. An oldsquaw is a type of sea duck, Clangula hyemalis. 2. According to St. Lawrence Island Yupik Elder Vera Kaneshiro, this is a man’s style parka.